Honoring Dr. King today I will repost and expound upon what I wrote a year ago for Martin Luther King Day. In a good way it’s astonishing to me how fast the “Climate Justice Movement” has grown globally in the past year. A year ago nobody heard of the Green New Deal or any of the teenage and kids groups protesting such as Greta Thunberg. MLK paved the way, creating the peaceful blueprint for very effective protests for social justice and now climate justice, which is very much related. From 1/15/2018: Dear Diary. Instead of presenting climate change findings today this short essay will address the spiritual health of a society that in general knows how to progress, as in the case with green energy, but lacks the spiritual and even moral wherewithal to do so. Today is Martin Luther King Day in the United States. Were MLK alive today what would he say about where the U.S. is on global warming? Not many people know that I am also a Baptist minister’s son following lock and step spiritually with climate scientist Dr. Katherine Hayhoe. Before my dad passed at the turn of the century he came to know how passionate I was on the climate change issue. What I failed to recognize before my dad’s passing is that people won’t change just by presenting facts alone, particularly if the road ahead is hard, and there are easier, more enticing paths to follow. In the past couple of years, particularly after the Popes Encyclical on climate change, I’ve come to understand that a society or country won’t do the right thing unless it is morally grounded. Science can open eyes showing all how creation works and reacts to different physical stimuli, but morally grounded leadership is necessary to implement good plans. Spiritual leaders and scientists can work in tandem to guide Earth towards a bright, green future. I wrote the last two paragraphs during the early dark days of 2018 when Trump, Scott Pruitt and others were tightening their hold on the United State’s energy policy. Now in early 2019 I get a sense that the people of the United States have had enough of lies, particularly in the wake of Michael and the California fires from last summer and fall. One of the failings of leadership is not recognizing that analytical knowledge can’t be separated from morality involving empathy and compassion. What would MLK think about Puerto Rico in early 2018? After moral authority is given by a leader like Pope Francis on the climate issue, we as a society need to move forward. Science sometimes opens Pandora’s boxes like the splitting of the atom or the internal combustion engine. Spiritual leaders like Dr. King can guide planners to use new discoveries to benefit all, particularly the least among us, while molding individuals to do right by their fellow man, guiding us to stay away from Pandora traps. We will be draining great political wounds here in the U.S. in 2019. It’s oh so easy to side with the lie that all is well, and we can defile the planet with carbon pollution to our heart’s content. In 2016 we elected leaders who greedily want to take the short sighted, most profitable, easy way out regarding energy use. By doing so, as Dr. King stated, we aren’t walking on the Earth with our brother and sister nations, as guided by the Pope, towards a green, vibrant city on a hill. 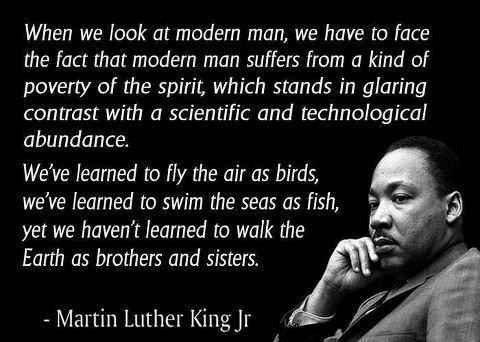 Morally we have lost our way on the climate issue, but that is changing I feel on this MLK Day. I’m optimistic that after the elections of 2018 and 2020 every generation in the U.S. will do the right thing, joining the rest of the world, battling the evil behind climate change after the combination of much soul searching and more good science. MLK, to my knowledge, had no scientific idea that the issue of climate would become so big later in the 20th and in the early 21st century. He would be horrified about the scientific truths that the Industrial Revolution have wrought. Nevertheless, I’m sure that he is looking down on us from heaven, smiling, knowing that despite a very hard road ahead, we shall overcome. >Big glaciers on Greenland, such as Jakobshavn, are flowing quickly into the ocean, raising sea level slightly. Thanks for your comment Bentley.